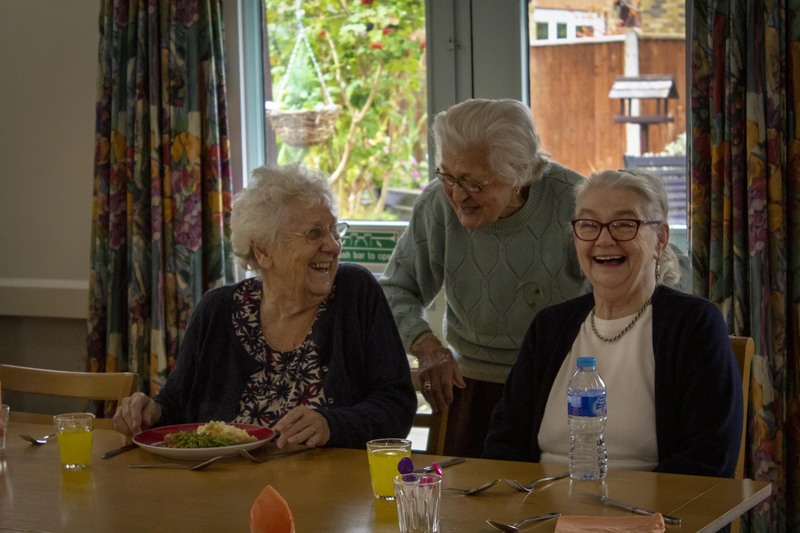 Lunchtime is an important aspect of the specialised dementia care provided by Daybreak day clubs in Oxford. It is so much more than just food, a mealtime forms part of our Cognitive Stimulation Therapy. For some of our members, particularly those who are living alone, having lunch at a Daybreak club may be the only hot meal they will eat that day. Daybreak Members enjoy lunchtime together. Sharing mealtimes with others is a valuable way to encourage communication and stimulate memories. Over time a person with dementia may find that their appetite declines or food doesn’t taste quite like it did before. Sensory changes such as sight difficulties and a decline in the ability to smell and taste food can impact on a person’s ability to enjoy food and mealtimes. As a result, their interest in food and eating can decline. Added to that, communication difficulties may make it hard for a person to say what they like or dislike or find difficult about mealtimes. Daybreak provide a freshly cooked lunch for all our members and we take care to meet the tastes, appetite and preferences of each individual to ensure everyone has an enjoyable meal. We understand that some may only manage a bowl of soup whilst others will greatly enjoy a full roast dinner! Eating can be a serious challenge for a person with dementia. Changes in the brain can cause problems with visuospatial awareness and a drastic reduction of hand dexterity and motor skills. This means that the individual may not be able to gauge properly where the plate lies or where the food sits upon it. And, when they find it a lack of dexterity means that only a small portion of the food may be reaching their mouths, limiting their intake. Daybreak staff provide the support and assistance to help our members with mealtimes. For example, where possible, we use specially designed crockery that is brightly coloured and interestingly shaped which can help overcome some of the visuospatial awareness problems and can prevent or delay the need for a person to be fed by a carer, thus keeping a better sense of wellbeing and enhancing the enjoyment of mealtimes. Sharing mealtimes with others is a valuable way to encourage communication and stimulate memories. The smell of food is a powerful tool for evoking memories and stimulating appetites and conversation. Time spent together over a meal will make a person feel better engaged, they will benefit from the experience of being part of a group and this can help reduce feelings of loneliness. We work hard to ensure all our members are fed well when at our day clubs and always have a choice when it comes to their meal. We carry out evaluations with our club members to ensure that we are meeting their needs. In our last evaluation, over 98% strongly agreed or agreed that the food provided is good and mealtimes are enjoyable. To enquire about membership, visit our clubs page and fill out an enquiry form for one of our Daybreak clubs, or call us on 01865 776744.